Life is hard. But it would be infinitely harder to imagine what it would be like without all those goofy looping GIFs that now, more than ever, keep us giggling. Even if you never made a GIF in your life — and never intend to (never say never) — you already know Giphy as the master of a vast repository of all kinds of animated craziness. 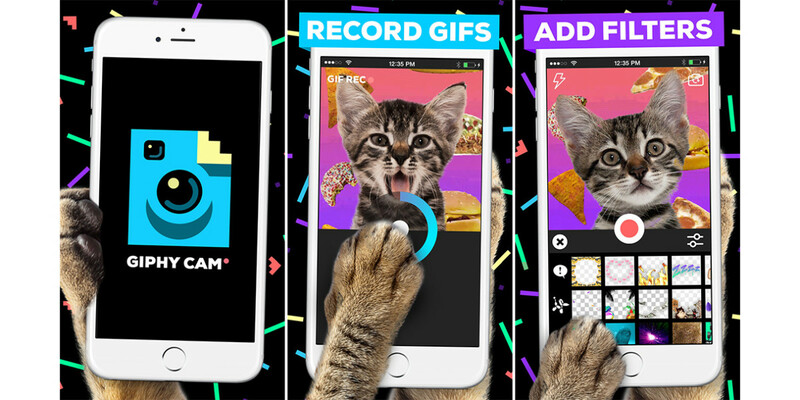 And today Giphy aims to get you into the act with the release of Giphy Cam, its own GIF maker. No longer must you rely on your own resources to create GIF animations for Giphy, or for any other purpose — all you have to do is download the free Giphy Cam for iOS and all will be well in the land. This new camera lets you shoot a GIF, slather it in filters, overlays and effects and easily share it to Instagram, Twitter, Pinterest or Facebook Messenger. You can also email, text or save it to your Camera Roll as well. After downloading Giphy Cam, you are presented with a vertical interface punctuated with a red Record button. Tapping the button activates burst mode while holding it down will give you a traditional looping movie. Set up your GIF by choosing a filter from the top row (if you want — you don’t have to) and then choose from three rows of special effects underneath. Then hit the red button to get the kind of GIF you want. A flash control is available as well as a reverse camera (of course). If you like the result, you can save it, which sends the GIF to your Camera Roll. If you’re not satisfied, you can redo it as many times as you want. Hit the Redo button after saving to create another GIF. Giphy Cam starts off with about 40 effects in all and that is not nearly enough. However, it’s certainly easy enough to make and post a GIF to Giphy or your blog or anywhere else you wish. While the app is only available on iOS for now, there will be Android news soon, says Giphy.